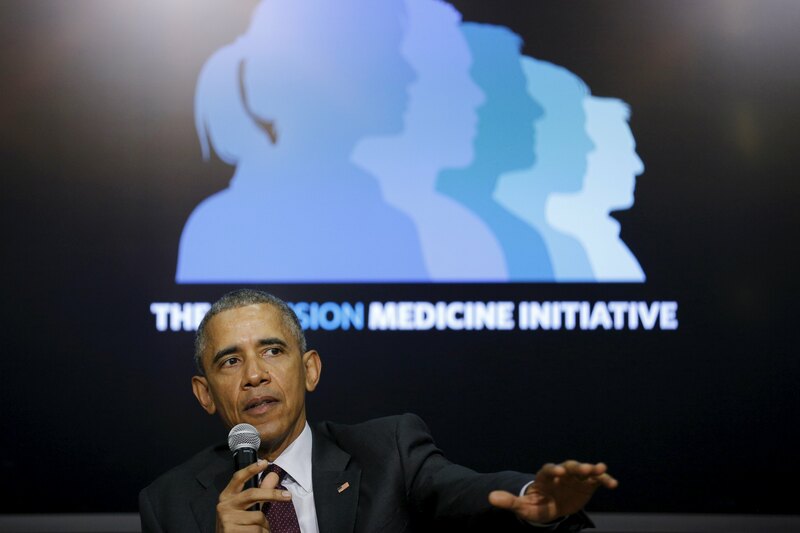 A year ago, President Obama outlined his Precision Medicine Initiative and today, at a White House summit with health and science leaders, he announced the next steps in the hugely ambitious effort to study a million people's genomes and develop more targeted treatments for diseases like cancer and diabetes. The aim of the initiative, the president said, is to usher in a new era of medicine that will harness data to support and advance research, technology and policies and to empower health care providers and patients. This is "an extraordinarily exciting time in medicine and the biological sciences," he said, that builds on the work that was done in mapping out the human genome. "It is spurring on a whole new set of understandings about how diseases operate, about how the human body, how cells operate, how areas like cancer show how each cancer may be unique, even if it's in the same organ," he said. The goal of precision medicine is to"get the right treatment to the right patient at the right time," providing more personalized care, which could ultimately result in better outcomes at lower costs. "This can change the way we do research," the president said, but a new era of medicine calls for new ways of thinking. The way medical data is stored is antiquated, and privacy issues need to be addressed so patients feel safe when sharing their health information for research purposes. The National Institutes of Health announced at the summit that it's moving forward with a plan to create a one-million-person health information database by 2019. "The goal is to create a common database of ultimately a million people that is diverse. So ultimately we can take a disease that may be rare and start seeing patterns we may not have seen before," President Obama said. NIH Director Dr. Francis Collins, who is spearheading the effort, told CBS News that it will focus not just on illness but also on how to keep people well. "This would be a great opportunity to find that out, with one million people in the real world who are motivated to be part of research. Let's see what we can do to keep people healthy," Collins said in an interview last fall with CBS News chief medical correspondent Dr. Jon LaPook. The volunteers will give blood samples for DNA testing, and may wear health tracking devices to gather data on exercise, sleep and other factors. "They will have the opportunity to be full participants in this," Collins said. "They're at the table and they will get information back." An NIH-funded Vanderbilt University pilot project will explore how to attract volunteers for the project and how to collect the data. It will also look into what volunteers want to learn about their own health. Health officials are also hopeful that in the long run, the effort could help revolutionize how we diagnose and treat a range of diseases. "Most of medicine, for our history, has been done one-size-fits-all," Collins said. "But we also know it doesn't always work. Well, that's because we are not one-size-fits-all human beings. We're all individuals. We all have different genetics and different environmental exposures. And ideally, then, you'd want medicine to adapt to that." Collins said now that scientists can screen for all kinds of individual genetic differences, medicine needs to be taken to the next step. "Let's just sequence your genome and see what variations you have that might say, you know, that drug over there might be good for you but not at that dose. Better cut it back because you're going to be very sensitive. Those kinds of opportunities are now bubbling up all around us. And it's time to make a big push and see can we do this in reality, and actually, then, begin to implement it in practice." Collins said the precision medicine approach is especially promising when it comes to cancer. "We are at the point now ... of taking a lot of what we do for cancer away from the one-size-fits-all and into this space of targeting therapy based on that individual's tumor and the analysis of it," he said. "Cancer's a disease of DNA and we, increasingly, are understanding which of those mutations are bad ones and what you could do about it." New drugs are able to specifically target those molecular problems, unlike traditional chemotherapy treatments that work by killing off cancer and healthy cells alike. "This is much more precise. It's a smart bomb," Collins said about precision medicine. President Obama will ask Congress for $309 million next year to support the initiative. "Doctors, governments, agencies, private sector, academics" will all be involved, said the president, "making sure we're all working in the same direction. If we do that, I'm confident for Malia and Sasha's generation, we'll make progress." Others involved in the initiative include the American Medical Association, numerous health care systems, academic centers, drug makers, and organizations including the Bill & Melinda Gates Foundation, Microsoft, and Amazon Web Services.